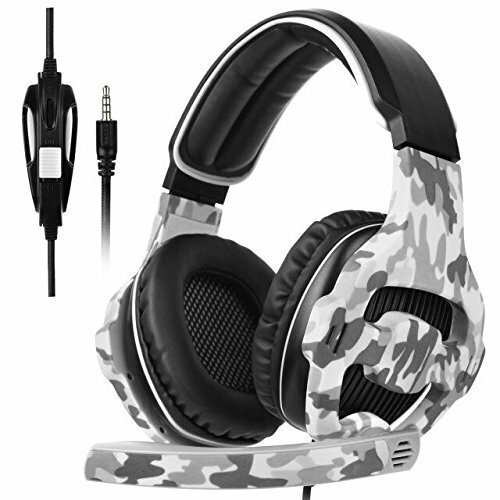 Get an great audio experience with Sades SA810 PS4 xbox one Gaming Headset Designed specifically for PS4,2017 New Version Xbox One,PC, Notebook,Laptop ,Tablet.Easy to set up and delivers high-quality, amplified digital game and chat audio through 40mm speakers without disturbing others. Sound is too small or no sound: Ensure that your audio devices work properly and sound switch has been turned on ; turn up the sound volume level, Ensure connecting the plug of headset to audio source correctly. HIGH QUALITY MICROPHONE. Headset integrated mic with super noise-reduction function, can pick up sounds with great sensitivity and remove the noise.Long flexible mic design very useful and portable. COMFORTABLE FIT.Softness and good air permeability protein earmuffs, multi points presure head beam, accord with human body engineering specification. STRONG BRAIDED CORD:High tensile strength, anti winding braided line, with the designed specifically for gaming users and the design of the heart by wire. MULTI-PLATFORM COMPATIBLE:Compatible with PlayStation 4,New Xbox One,PC and Mobile/ Tablet devices.Please note that you need an extra Microsoft Adapter if you own an old version Xbox One controller. If you have any questions about this product by SADES, contact us by completing and submitting the form below. If you are looking for a specif part number, please include it with your message.